Performance Zither was created to increase playability while reducing the amount of time spent “taming” parameters. The instrument provides a variety of articulations and sound-shaping options and even includes some tools that can help spark creative ideas. This instrument comes in both 24 and 16-bit versions. When loaded into Kontakt, the 24-bit version uses about 77 MB of RAM and 933 MB of disk space, while the 16-bit version uses about 71 MB of RAM and 439 MB of disk space. The Zither was sampled meticulously and uses a total of 537 samples. Under the hood, Performance Zither is powered by a custom script that provides advanced features like randomized round-robin, decay-matching release samples, arpeggio generation/detection algorithms, and more. 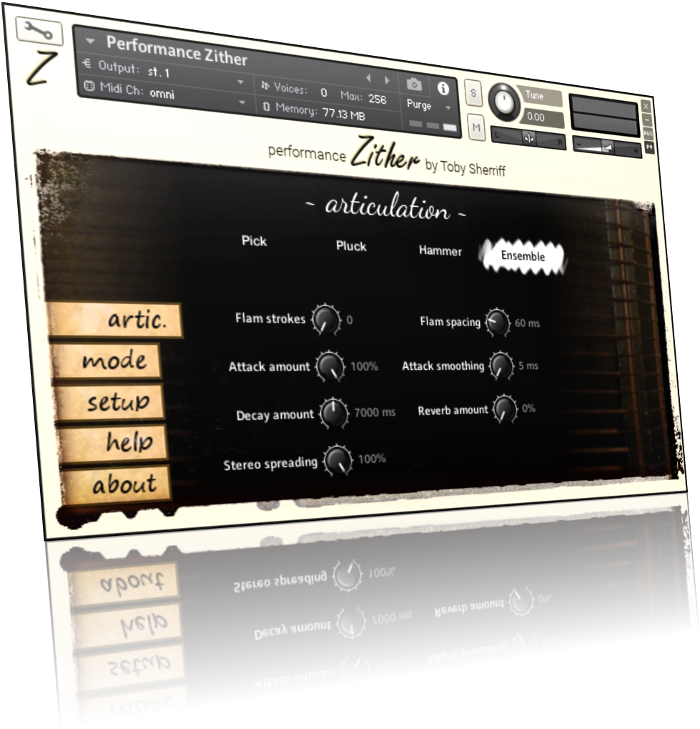 Performance Zither requires the full version of Kontakt 5.5. If loaded into Kontakt Player it will only operate in demo mode. This is a restriction imposed by NI, not Performance Zither. Performance Zither Free is offered free of charge, and may be used for personal and commercial purposes. Plucked, hammered, and ensemble articulations are only available for 5 minutes in the free version. Performance Zither is available at a price of $10 USD, and may be used for personal and commercial purposes. Performance Zither is provided without warranty; however, please contact me directly if you have any questions or comments and I will respond as soon as possible. If you enjoy my work and would like to donate to help with future releases, please donate via PayPal. Thanks for your support!